Containment Protocols: RPC-101 is to be stored in a 4m x 4m x 4m insulated room at Site-062. A radiator is to heat the cell to 50 degrees Celsius. In the event of a containment breach, MST Tango-121 is to locate RPC-101 for recontainment. Description: RPC-101 resembles a humanoid entity, notable for its lack of eyes, reproductive organs and hair and two extra pairs of arms. The way in which RPC-101 walks resembles that of a quadrupedal mammal. The nails of RPC-101 allow it to climb on any surface at high speeds. RPC-101 has been known to be highly susceptible to heat, losing all anomalous abilities and becoming highly docile when exposed to temperatures greater than that of 40 degrees Celsius. RPC-101 is highly aggressive to any living entities and lacks any higher brain functions2. RPC-101 has been known to have sporadic bursts of lucidity, becoming intelligent for a short period of time. These episodes last anywhere from two minutes to ten minutes in which RPC-101 has been known to speak, usually showing fear and confusion. On one incident, RPC-101 grabbed a researcher and began repeatedly shouting "What happened to me" before entering an unconscious state. The most notable anomalous ability of RPC-101 is its ability to generate spatial anomalies, commonly referred to by containment personnel as "rifts", on any nearby flat surface. RPC-101 creates such rifts by inserting all of its fingers into one central point on the surface and then "tearing" it open. These rifts absorb any electromagnetic radiation which contacts them and are relatively circular in shape with an average diameter of one meter. Any subject that enters a rift will be instantaneously transported to a random location on Earth3. The rifts effects only take place when the subjects entire body has entered it. Rifts usually dematerialize after three to four hours, leaving the original surface in its place. Any material or object is able to pass through these rifts as long as they are able to fit within one. A rift has been known to allow any number of items through it while active. Discovery: The first sighting of RPC-101 was at a beach in South Africa near the town of ██████. RPC-101 was found to be heavily injured and unable to move. RPC-101 was found wearing a heavily burnt nylon backpack4 and both were collected and transported to Site-062 where its injuries were treated. Addendum A: A search of the bag found on RPC-101 revealed three photographs, a folder, a note and a newspaper cut-out. The photograph of the Antarctic facility. 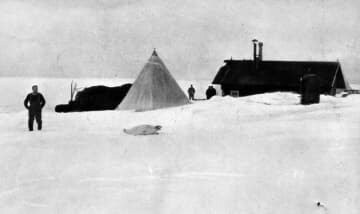 The first photograph shows an Antarctic facility5 with a figure wearing heavily insulated clothing standing in front of it. The second photograph shows a group of unidentifiable creatures resembling large humanoids during a blizzard. The third image is an image of a coast covered in lava. The location of the coast could not be identified. All major cities are currently evacuating as the surge of disasters continue. The entire continent of Africa has been ravaged due to highly anomalous volcanic activity. Citizens are urged to take refuge in the countryside and find a safe underground bunker. The folder found in the bag appears to be a test log titled "Drug Development". The range of the tests go up to 51 but all have the word "Failure - Brain failure and physical deformation including: blindness and loss of hair" written on them. The description of the test shows that the item being tested is a drug containing several classified anomalous ingredients, a few of which are not known to the Authority. There is an empty page titled "Methods For Dampening Side-effects". Many pages are burnt beyond recognition. I’m going to try make it to Site-███. I’ve got something there that can help escape this mess. I’m going to take the risk and use this drug. I’ll need it to get there. It’s almost 7 miles. I’m going to die either way. What have I got to lose anyway? 1. Mobile Specialized Team Tango-12 (“Eye from the Sky") are embedded in both domestic and foreign intelligence services of national governments, and specializes in surveillance and clandestine operations on persons of interests to the Authority, and RPCs reported missing from containment. 2. Scans show great similarities between the brain of RPC-101 and that of an adult human. 3. RPC-101 is capable of controlling the destination of rifts it produces, and utilizes them to escape pursuit. 4. The backpack was found to contain a [REDACTED], several photographs, a note and a newspaper cut-out. 5. The appearance of the facility matches that of an Authority research facility.